Docking our keelboats under sail is one of the most difficult skills required for the Senior Rating.  This series of blogs is intended to give you a conceptual framework for doing it. With that framework and a lot of practice, you'll acquire this important skill. 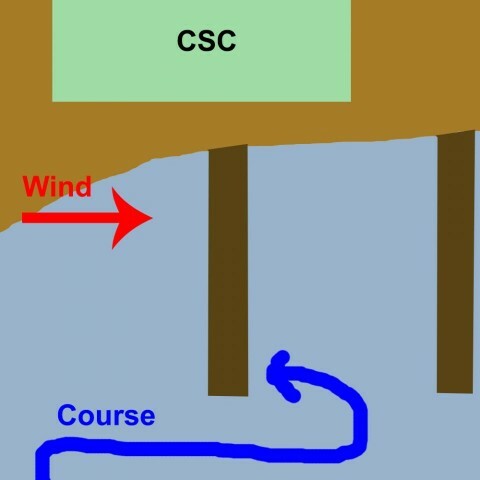 For simplicity, we're talking about a "normal" upwind docking into a CSC slip, where the true wind is out of the West or South-West, but not too far South. Love this. Great work, very informative. Thanks! Docking our keelboats under sail is one of the most difficult skills required for the Senior Rating. 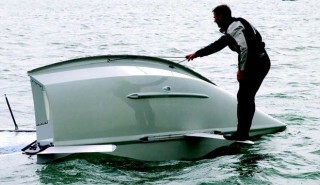 You have to be able to do it in all wind directions and in several boat types that handle very differently. It takes a huge time investment and a lot of commitment and practice to make the grade. 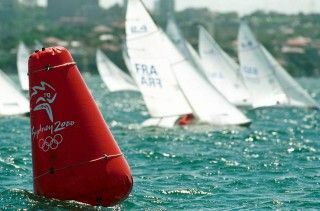 Everything you've learned on dinghies applies to keelboats, and on dinghies you establish a solid basis of sailing skills. 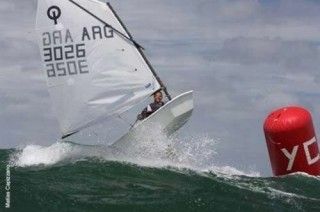 This is why we require a Junior rating to take keelboat lessons, and why it's important to get your Senior Dinghy test passed before getting serious on keelboats. 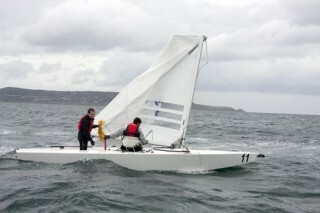 But the transition from a dinghy to a Pearson Commander is not easy, as the latter has a large mass and a full keel, so it handles very differently from a dinghy. It does everything slowly, including stopping, but also powering up. If you get below the critical speed for steering it, it can take 8 or 9 seconds for the keel to power up, and in that period you're being pushed sideways. You could end up pressed against a downwind piling or boat. 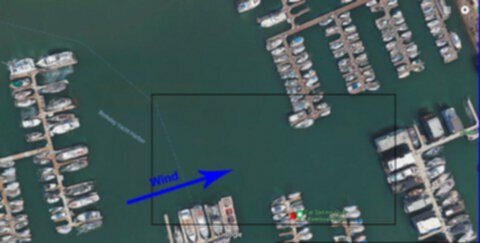 Our keelboat slips are faced approximately west, so normally into the wind, just like our dinghy dock in the South Sailing Basin. So in a "normal" west or south-west wind, you dock pretty much the same way. Slow sail on a close reach into the dock/slip. But the boats are very different, so the procedure becomes more challenging on a keelboat, not to mention the damage you can do if you screw up. 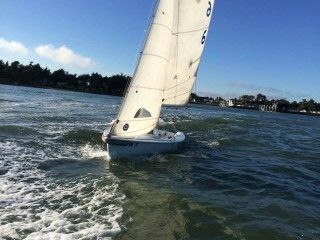 This is the first in a series of blogs on keelboat docking to help you understand the differences between dinghy and keelboat and the additional factors that become important with the latter. I will assume a "normal" west or south-west wind, as this is what you'll be dealing with 80% of the time, at least. And initially, I'll be assuming relatively constant wind, although later in the series I'll talk about wind shifts and how to deal with them. I'm also assuming that you're planning to go into one of CSC's docks with a reasonable amount of time to prepare and plan. As you get more advanced, you will be required to do very quick impromptu dockings, but that comes much later. When we're going for Senior, in both dinghy and keelboat, we're quizzed on how we would deal with rig failure, a shroud or even worse a forestay. We know the answers, and we carry line and maybe shackles to jerry-rig something, and we think about the extra lines we can use, especially on the keelboats where there are multiple halyards, topping lifts, and the rest. But it's one thing to "know" how to deal with it, and completely another to deal with it when it happens. I was doing a dinghy qualifying cruise to Treasure Island under Mark Playsted's supervision. Not a difficult cruise, beat out, run back. It was blowing pretty hard, gusts into the twenties, forecast for higher. We had two Ventures with 3 people in each, which worked out well with one person on the wire a lot of the time going out. We were almost to Treasure Island when it happened. I saw Mark on the wire in the other boat go into the water, then I saw the mast at maybe 20 degrees off the vertical. It was clear that they had lost their forestay, and I thought the mast was next. But it wasn't. They were holding the mast up by hand and getting the mainsail down. 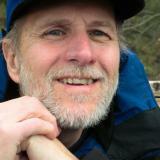 Within about 15 minutes, Mark had rigged the auxiliary stay to the bow and the boat could sail. They made it back under main and gennaker, and BTW the gennaker took a lot of the load that the missing forestay would have. It could have been my boat, and I don't think it would have come out so well if it had been. I'm thinking dismasted here. It was great to see how this could be handled, if you do all of the right things quickly. Great blog post, John. What material are you using for your 6' and 12' lines that you are carrying in your life jacket? Dry capsize is a very useful skill. It means not going into the water on a capsize and getting into the boat as it comes up. The first part is relatively easy, but the second can be difficult, especially in a Quest. I went out in some seriously high wind the other day, and I wasn't happy with my dry capsize skills. I hadn't capsized in quite a while, so I was a bit rusty on it. I could get the boat up, but not me in it as it came up. So it was time to practice, which I did. If you're single-handing or with one crew in high winds, it's important to get someone into the boat when it comes up to get it under control, prevent a re-capsize and prevent it sailing away from you. That said, if you're out with a group of students or inexperienced crew, you shouldn't do it. You want everyone in the water after the capsize, especially if the crew is new to the situation. If they see you climbing up over the hull, they'll all want to do it, which will make your job righting the boat that much harder. Better to get everyone in the water and comfortable and go from there. So let's assume you're single-handing and you capsize. Getting up on the hull as the boat goes over is no problem, as it happens pretty slowly. You can climb up using the mast as a step or even the hiking straps. When I practice, I find that it's pretty hard to capsize the boat without going into the water. I just have to keep pushing weight to leeward and then climb up when it's past the point of no return. So you're on the hull and drop down to the centerboard. You should have thought how you're going to lever the boat up. There are several options, depending on how large you are. As yet, there are no righting lines on the Quest (coming, maybe). If you're large, you can just pull on the gunwhale to bring the boat up (I can't do that). The next option is to pull on the jib sheet against the fairlead, NOT against the sail (this works for me, 147 lb. male). That doesn't work for smaller people, so bringing the bow painter around the mast and using it allows you to get far out on the centerboard to bring the boat up. We are blessed in the Bay Area with incredible summer sailing conditions - 15 to 25 kts every single day from the West to South-West and waves to match. What could be finer? Fall-Winter-early Spring is problematic. The system that creates the big daily summer winds in gone, so the winds are typically very light, except in storm systems, where they can be over-whelming (35-40 kts, typically from the South). So many just don't sail in the winter. I think this is a mistake, for at least two reasons. One is that you learn an awful lot about sail trim and boat balance sailing in lighter winds (5 kts or less). Everything changes, from the way the winds are produced atmospherically to how you set the sails. For example, in lighter winds the wind at the sea surface is practically zero, and difference between the wind there and the wind at the top of the mast is (relatively) large. So you're getting most of your power from the top third of the sail, which you want to keep happy. In higher winds, there isn't that much difference between surface wind and wind at the top of the mast. In very light winds, the wind may not be strong enough to hold the mainsail and boom to leeward. So you need weight to leeward to tilt the boat enough so that gravity pulls the sail to leeward and forms the sail shape. With the sail shape formed, the wind will power it. And the battens bay not flip on a tack or gybe, so you might have to shake the sail to get that to happen. The last in the series - Apparent Wind downwind. It's hard to steer downwind. The waves toss the boat around more, and if you get tossed too much, you'll gybe when you don't want to. You can capsize on a broad reach in heavy winds and seas. The biggest thing you have to deal with is apparent wind. On a downwind course, small changes in course, wind speed, and wind direction produce large changes in apparent wind. 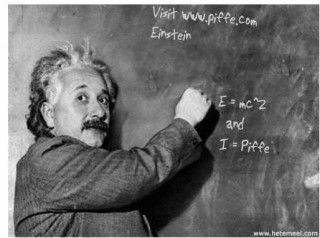 We have a teaching philosophy that is unique. Most sailing schools will do a "ground school" for hours before the students get on a boat. The idea is to explain how it all works, so the student is prepared intellectually for the experience. Our approach is to get them on the water right away and have them just do it - steer the boat, tack, and get the feel for it. I believe that our approach is correct, up to a point. You need some practice before the sailing theory makes any sense. 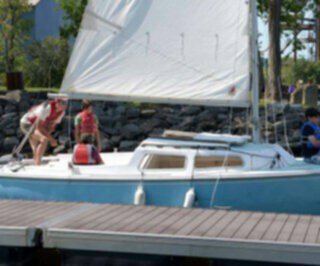 And my experience as an instructor is that a beginning student will do just fine steering beam reach, tacking, even steering close-hauled without any discussion of how it all works. The turning point is when they try to control the tiller and the main sheet at the same time. Lots of confusion, including understanding wind direction. Tacking from beam reach to beam reach and seeming to lose the wind (because the sails are trimmed too tightly). can be explained simply), with a visual from above. 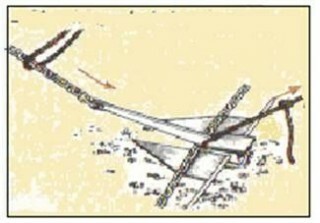 The key concept is that upwind (beam reach and higher) the sail is a wing, it works just like the wing of an airplane. Now an airplane wing has to be at a certain angle to the wind, or it doesn't work. Same with a sail. 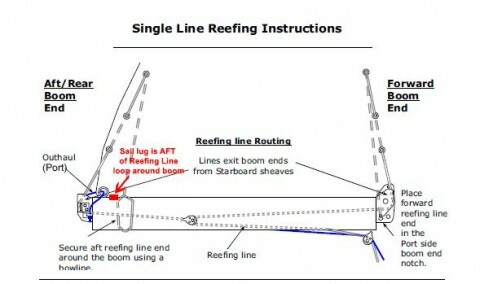 So when you're trimming the sail going upwind, you're keeping the sail at the same angle to the wind all the time. 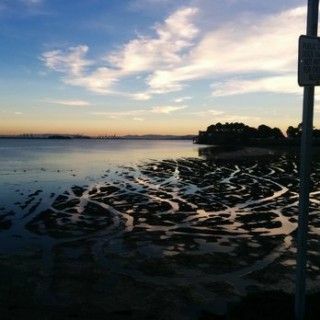 I posted while ago on launching in low tides. The idea was close attention to sail trim. 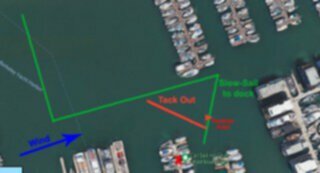 The common mistake is to over-sheet the main leaving the dock, and even with full centerboard you'll drift sideways into the Cal Adventures dock. Here I want to talk about docking in low tide. There are several problems. One is recognizing that it's low tide. It's easy going out with a "fresh" boat (you push the centerboard/rudder down and feel the mud, so you bring it up a few inches). But coming back you have to recognize and plan it. My rule of thumb for Bahias is that a tide of under +2.0 means you have to raise the centerboard and/or rudder. Plan for it, and raise both on the way in. When it's all the way down, the centerboard is about a foot lower than the rudder fully down, so you can adjust the two differently. In very low tides, the rudder will be just below the water, horizontal. It will work, but it will be very hard to use, and hard to turn quickly. Also, the stress on the rudder when it's parallel to the water surface is in a direction it's not designed for. So it's best to limit the amount of time you sail with the rudder in that position. You will find that the boat handles differently with the centerboard up (or raised above the normal, fully down position). An important thing in docking is that the pivot point of the boat is farther aft, which means that where the boat actually turns in the water will also be farther aft. The dock approach will be different in low tides. You can't use the standard "come in on a beam reach and slow sail to the dock". Your leeway with the centerboard up will be too much. Even if you aim for the south end of the dock, you'll be lucky not to hit the sea-wall (painful personal lesson here). I love trivia. Probably my age, or my geek background. (ii) A vessel under oars may exhibit the lights prescribed in this rule for sailing vessels, but if she does not, she shall exhibit an all around white light or have ready at hand an electric torch or lighted lantern showing a white light which shall be exhibited in sufficient time to prevent collision. Not useful for right-of-way. O course the generic any vessel rules apply to a kayak (sailboat overtaking a kayak, or for that matter a slow moving powerboat, must give way). The Advanced Dinghy lessons this year have been uniformly great. This week's was no exception - boat handling by Jonas Kellner, a club member who's been sailing for over 30 years and teaching sailing and racing for almost as long. Someone asked Jonas before the class whether he'd be teaching racing tactics. He said that he could, but knowing the best tactic for a given situation is useless if you can't execute the maneuver. He'd be focusing on the latter. We had a pre-sail briefing, where Jonas explained what we'd be doing. 8 exercises around a set of buoys in a line perpendicular to the wind (so basically beam reach). The first and last exercises were slalom course, where we were to keep as tight to each buoy as we could.